So you want to build a coral reef? Artificial reefs good or bad? You think it would be a cool thing to use your hands to regenerate a coral reef? See a tangible piece of your dive volunteer handiwork grow? Like all that? Read on. After seeing the enthusiastic reef building culture in the US, it makes you wonder, if the benefits are obvious, why aren't there more of them in Asia and Australia? There is a lot of dense literature on the topic. We build lots of artificial reefs around the world. But the reasons aren't always altruistic. And it is a topic that often polarises stakeholders. Embedded in the altruistic mission statement of the Bundabergers are a number of premises that most government agencies and marine scientists will readily dentify as controversial. Good for fishing stock? Not always. Obvious economic benefits for stakeholders in tourism, environmental conservation, fisheries and divers? You can never make everyone happy. A wholesome exercise in reef building for community participation? This conveniently sidesteps environmental pollution and occupational health and safety issues, particularly for artificial reefs built from sunk vessels. Let’s get stuck into the science, then the socio-economic cost/benefits analysis. Most coral reefs do well in waters of 26 degrees or warmer. Few survive at temperatures lower than 18 degrees – although we are talking about tropical coral here, not deep water coral, which is a rarer phenomenon endemic in places like the UK and Norway. The latitude band that commonly comes up in Coral 101 literature is 30°N and 30°S, although this is an over simplification. Most coral exists in the Indo-Pacific, Coral Sea, Central America-Caribbean, and fringes of the Red Sea and Australia. Funnily, not much coral exists around South American and African coastlines, due to a combination of cold upwellings and discharge from big rivers like the Amazon. So, you won't find much reef building activity in Europe, South America and Africa. But sea temperatures alone don’t determine whether we plant reefs. The main determinants are socio-economic. You have to ask why there is a need to build a fake reef. And does building one achieve those objectives? Most often, we think of artificial reef generation as a response to overfishing or replacing fish habitats that have been compromised by coastal development. This is the case in the Philippines, where there is an extensive government program with over 21,600 reef modules deployed. But artificial reefs reach their highest science in North Asian countries of Korea, Japan, Taiwan and China. There, the motivation behind artificial reef building as fish aggregation devices is akin to cattle penning, ie., food. The Japanese, for instance, build both shallow-water reefs for shellfish and seaweeds and deeper water reefs for finfish. This isn’t tree hugging, it is commerce, pure and simple. Then again, artificial reefs may be for the enjoyment of fishermen and divers which will, handily, drive tourism into the local economy and increase tax revenue. The artificial reefs in the US are mostly for recreational use. The historical genesis of artificial reefs in the US was also influenced by the need to find a convenient way to dump WWII ships and other bulky waste. You can start to see the convoluted picture of stakeholders involved. Commercial fishermen who cling to their livelihood, recreational fishermen who compete with commercial fishermen, divers who don’t like to see any fishermen, conservationists who balk at possible pollution and the artificiality of it all, neighbouring fisheries or villages whose local reef fish may be attracted to the new artificial reef, scientists who disagree with each other’s findings, resource managers and government agencies who try to mediate everyone. Add to this wash the fact that artificial reef building is an expensive and time consuming process, so mediating disparate stakeholder interests aside, you have to weigh the socio-economic costs against the perceived benefits. Then again, consider this. Most artificial reefs occur in degraded, fished out environments. If your local reef is thriving, why fix something that ain’t broke. This seems a no-brainer with the Great Barrier Reef in Australia, but there has been a serious study conducted by CRC Reef Research Centre (a collaboration between government agencies and research institutes in Queensland) about allowing artificial reefs – such as wrecks - in the midst of the GBR. You can put an artificial reef in the GBR. But the permitting process will be very, very daunting. That’s why we don’t have a big reef building culture in Australia. Down south, the water is too cold and up north, we have the biggest and best natural reef in the world. Let’s examine each element of the Bundaberg mission statement against available evidence: improve fish stocks, marine biodiversity and replace reef loss as well as create a diverse fish habitat. In other words, artificial reefs may concentrate and redistribute existing fish stocks, rather than enhance overall fish production. If the increased aggregation is accompanied by ease of catchability – namely, opening the site to fishers - the artificial reef has the potential to exacerbate, rather than mitigate, over-fishing. In fact, some experts hold the opinion that artificial reefs are nothing more than fish aggregation devices (floating devices that attract fish concentrations). The implications of overfishing are not merely local. Artificial reefs may attract fish from other natural reefs. This could lead to competition for food and predatory pressure between the reefs. An artificial reef could inadvertently offer concentrated catches of migratory fish that travel across oceans. This could disrupt inter-oceanic ecological systems and impact existing fisheries. But it can’t be all bad. Artificial reefs are still being deployed worldwide. In Australia, New South Wales and Queensland fisheries agencies are deploying estuarine and offshore artificial reefs. 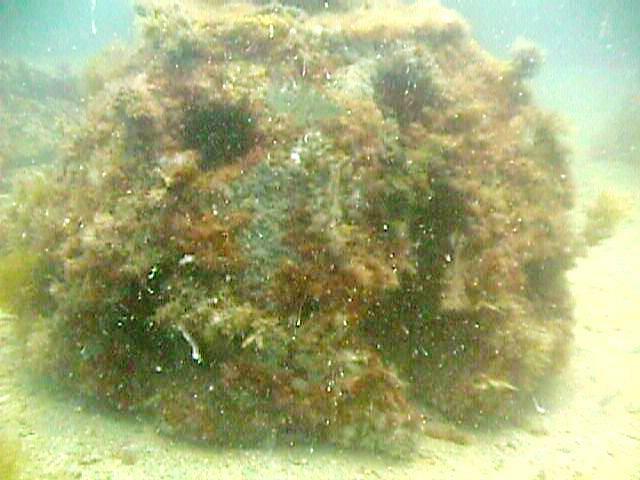 The offshore artificial reefs are large, purpose-built structures. In addition, considerable government funds are expended on scuttling of ships for artificial reefs. The recent HMAS Adelaide sunk off Terrigal, an hour north of Sydney, was done at the expense of A$8.5 million and much local protest angst over marine poisoning, detrimental tidal shifts and sand drift. In the US, there were equally protracted environmental battles before the Environmental Protection Agency over the disposal of PCBs (polychlorinated biphenyls), a substance used in paints, plastics and other industrial applications. The aircraft carrier ex-ORISKANY was sunk by the US Navy off Florida at considerable expense – over US$23.6 million - and after exhaustive studies by the Navy’s inhouse scientists to satisfy the EPA that ecological and human health impacts were not harmful. Planned and executed correctly, artificial reefs can support many lower organisms at the bottom of the food chain, offer fish shelter from predators and create coral substrate leading to an increase in fish production. The habitat aspects of artificial reefs are important enough that the several Fishery Management Councils in the US have determined that artificial reefs can be designated “essential fish habitat” under the laws relating to sustainable fisheries and fish conservation. The pro-active laws in the US result in significant funding at state and federal level being dedicated to building artificial reefs. On a smaller scale – and this is the area of interest to us volunteer divers – NGOs work with villagers in fished-out reefs in Asia and the Caribbean to replenish the reefs and restore damaged coral. So what are the considerations to be taken account of in careful planning, siting and building of an artificial reef? We’ve touched on the risk of artificial reefs changing fish distribution patterns between other natural reefs. A Taiwanese study suggests that a separation of at least one kilometre between reefs is needed, although that looks to be a lowball figure. And, to state the obvious, artificial reefs should not be constructed over natural habitats such as existing coral reefs, seagrasses and algae or areas with benthic life. Knowing what’s already there – the baseline – identifies the species of fish that normally inhabit an area and the prevailing environmental factors of an area. These factors will influence the type of fish attracted the artificial reef. Other factors affecting fish aggregation: topographic relief, substrate composition, temperature, salinity, food availability, and tidal or current movement, along with the absence of hypoxia, excessive turbidity, and toxic algae or chemicals. Then there are other considerations such as currents and storms which can cause the artificial reef to move, destroying both the reef and the area around it. Navigational considerations and, if the reef is intended for divers, a diveable depth and site, also come into play. You would like to think that the primary consideration of materials deployed on artificial reefs would be its ability to attract organisms to form substrate, its stability and its inertness to ocean water, thereby minimising pollution. Yes and no. Historically, in the US, artificial reefs were built from “materials of opportunity”. A euphemism for conscientious dumping. There is a fascinating government booklet “Guidelines for Marine Artificial Reef Materials” jointly written by various US Fisheries Commissions. It delves into the various materials that US artificial reefs are built from. Concrete culverts, warships, oil rigs, planes, trains, turn of century rail box cars, New York subway carriages, military hardware, cars, tires, municipal incineration ash residue….true. It’s all in the booklet. This is a bit of an oversimplification, but the general thinking went something like this: it’s too costly to break down the thing into salvage, we can’t sell the thing for security reasons, it’s too bulky for landfill, we need a reef, ergo. The US federal government used to give the warships for free to the states for reef building, but on the condition that the ships be taken “as-is”. It ended up subsidising the states in preparing the ships as artificial reefs because this would cost less to the Navy than scrapping the ship. Chew on this. A bigger legacy to the environmental obtuseness of the 50s and 60s was the use of tires for building reefs. It wasn’t just the US, a lot of countries did this. 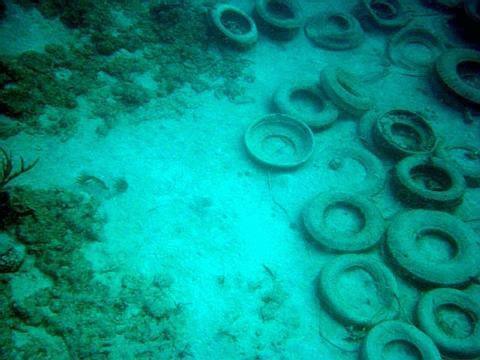 Tires were abundant and easily assembled like Lego into artificial reefs. They were deployed unballasted – ie., not weighted down. So the tires ended up everywhere – on beaches, mauling fishing gear and dredgers, sinking into mud …..incredible. Some charterboat captains who frequently dove US tire reef sites during the 1980s recalled areas covered by tires so great that divers would get lost among vast fields of tires. On a recent revisit to three tire reef sites, they found less than 50 tires left. More incredulously, this tire sea-dumping was viewed as a good solution to a waste disposal problem, completely ignoring the obvious risk of chemical leaching into seawater. It wasn’t governmental intervention that eliminated the practice, although laws were later passed to that effect. Rather, the development of a scrap tire market stopped the tire dumping. So much for materials of opportunity. In recent times, there has been a shift worldwide towards using materials dedicated solely for the creation artificial reefs. The material deployed depends on the need for stability, seafloor composition which decides how heavyweight the material can be, and propensity of the material to attract substrate-forming organisms. In Europe and Japan the dominant material is concrete. Japan also uses steel and fiberglass. Concrete is a favourite. It mimics the coral surface, is durable and stable, but is also heavy, requiring capital intensive deployment. Steel can be made into very complex structures used by the North Asian purpose-design reefs, also stable but susceptible to corrosion. PVC is moldable and lightweight but unstable. The modularity of Reefballs and Biorock has made its use popular for projects of smaller scale requiring flexibility. Biorock has a few drawbacks. The electrodeposition method of accreting limestone on a wiremesh structure involves the of running a low electrical current. The maintenance of an electrical source in the open ocean can be expensive and challenging. Chlorine, a by-product of the electrodeposition process, may also poison fish. Most of the people I met in the US who had participated in artificial reef building cleaned a ship for scuttling. It is no small task. Preparatory time can be years, involving industrial scale cleaning more appropriate to suitably trained experts with the right equipment than a public- spirited community effort. The health and safety issues can be daunting to comply with, if regulations don’t make it downright impossible to use untrained volunteers. In Australia, the Curtin Artificial Reef off Brisbane was built mostly by the Underwater Research Group of Queensland. The dive club towed the vessels out with their flotilla of recreational and fishing boats, then set off the explosives that scuttled the wreck. Amazing what you could do back in the 90s, before the avalanche of OH&S rendered such derring-do unAustralian. The Bundaberg and Districts Artificial Reef Association Inc. is still active, and the volunteers get busy stripping down vessels and planes in preparation for scuttling. Queensland OH&S strictures on diving would make it very difficult for volunteers to be carrying out the scuttling and underwater work. Community participation in Reefball deployment can be fun. Volunteers can make little plugs out of concrete, plant a piece of coral on the plug and then mount between 12 to 128 plugs onto the Reefball. At Les, the fishermen got their technique by trial and error, without the benefit of internet research. They settled on concrete, an inert substance that most scientists agree is the best thing for coral platforms - if you can haul it underwater. They learnt to use concrete plugs strikingly similar to the Reefball plugs. And they learnt from the strong currents that overturned metal coral beds that a dome shape like turtles were best aquadynamically. Researchers at National University of Singapore who are helping Les, thought that what the fishermen did with shape and material was pretty good.